It only takes 5 minutes or so to get from Kowloon Tong to the main Hung Hom terminus. 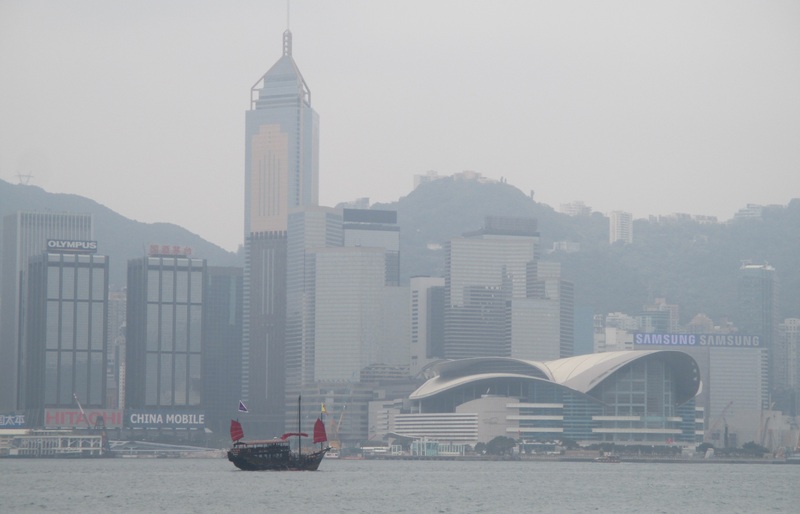 I left the platform and took the exit for the Tsim Sha Tsui promenade, that runs about a mile along Victoria harbour, from Hung Hom to the Star Ferry. I know of few nicer walks on a sunny (or even hazy) day. It’s views like this that will get me on a plane to Hong Hong anytime, at any notice, despite the jet lag. Of course, being Hong Kong the promenade is far from empty, and there’s plenty to see, what with the Japanese tourists, sweaty Westerners out jogging and local families having an afternoon out. Part of the promenade now has a ‘Walk of Fame’ – hand-prints of local Cantonese stars in cement in the pavement. I was ashamed to find that I actually recognised one or two names. 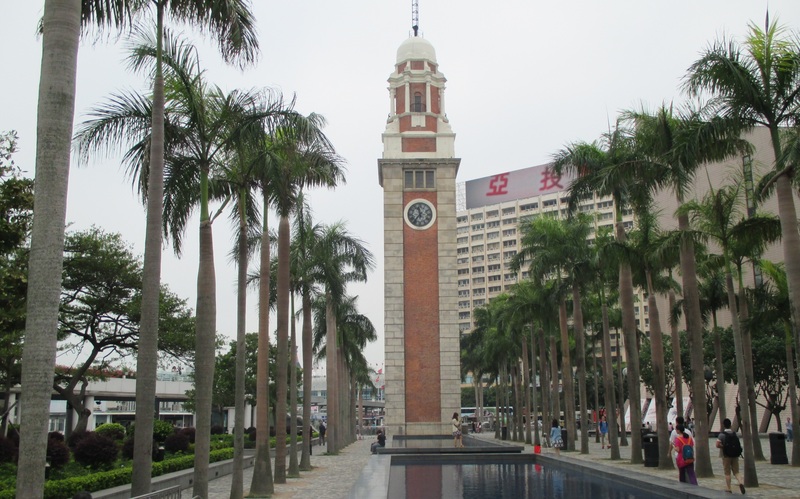 As you near Star Ferry, you come across the only remnant of the old Star Ferry terminus – the elegant clock tower. And so to Star Ferry itself. Star Ferry, crossing from the Kowloon Peninsula to Central District of Hong Kong Island, remains the best value entertainment in the world. There were riots in the 1960’s when they put the fare up (and it was the main way to get across the harbour). 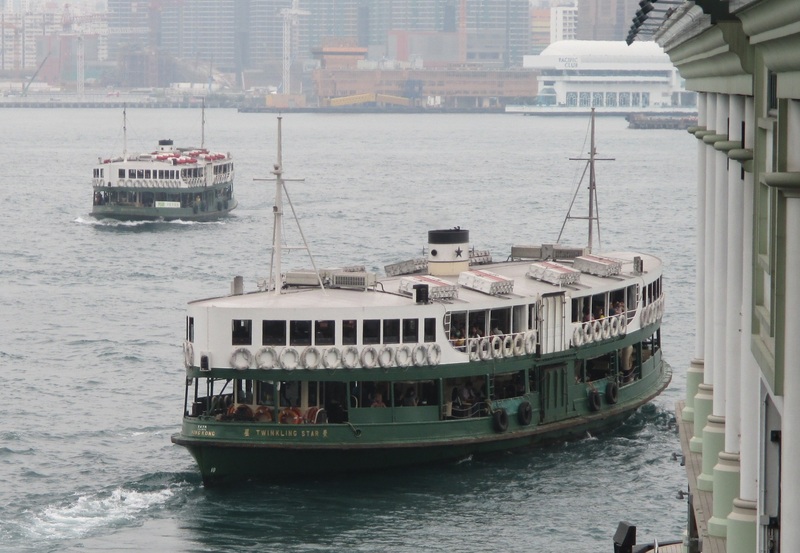 In 1981, when I first visited, the fares were HK$0.60 top deck / HK$0.40 lower deck. It’s risen to HK$3.40 for the top deck now, but at 30p sterling, you can’t really complain. There’s plenty to see in the harbour, including this warship moored to Ocean Terminal. The flow of ferries is constant, and even as one is leaving, the next one is waiting to approach the jetty. 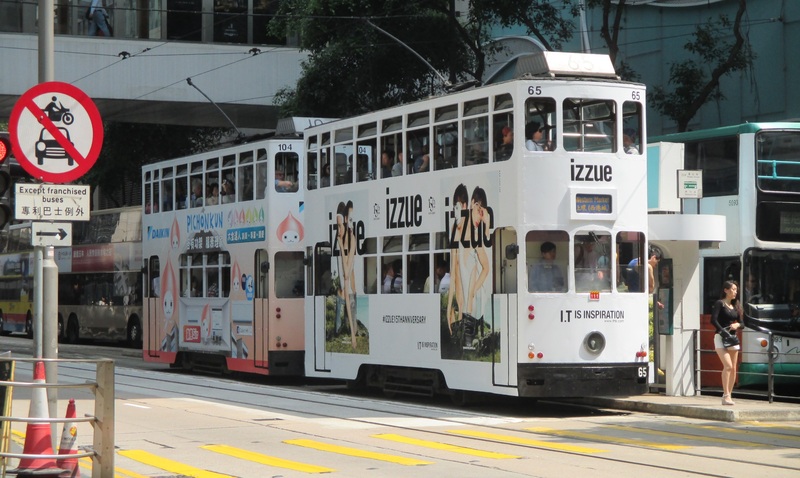 After a leisurely lunch with an old friend in the café above the ferry pier, I spent a few minutes looking at trams passing through Central district. And finally I travelled back to the hotel by the quick way – 3 MTR lines. It was nearly time to pack, and to head for the airport.